Isleworth takes its name from the Old English personal name Gislhere’ and worth, meaning enclosed settlement. It was first referred to, in a Saxon Charter of 677, as Gislheresuuyrth (although it had evidently been occupied as long ago as the Neolithic). By the time of the Norman Domesday Survey of 1086, there was a manor house here, together with two mills and a fishing weir, making the most of the riverside position. The manor house was rebuilt in the thirteenth century by the then owner, the Earl of Cornwall, although it no longer exists (the site now being occupied by the Duke of Northumberland public house). The church of all Saints was founded in the fourteenth century; the nearby nunnery of St Saviour and St Bridget of Syon in the fifteenth. Syon House was built in the sixteenth century, on the site of the by then dissolved nunnery, and was substantially rebuilt in the eighteenth. A number of other riverside estates and stately homes sprang up in the vicinity in the late eighteenth century. Isleworth was overtaken by the spread of the suburbs in the late nineteenth century. The church of All Saints was originally built in 1398, probably on the site of an older church referred to in a Saxon charter of 695. It was rebuilt in 1705, to a modified version of a design submitted by Christopher Wren two years earlier (the original plan having been rejected on the grounds of expense). It was then substantially destroyed in 1943, not by wartime bombing, as one might have surmised, but by an act of arson (those responsible also burning down the church of Holy Trinity in Hounslow). It was subsequently rebuilt in 1967-70, with the surviving old stone tower incorporated into the new brick structure. The churchyard was the site of the burial of a total of 149 parishioners who died in the “Great Plague” in 1665. 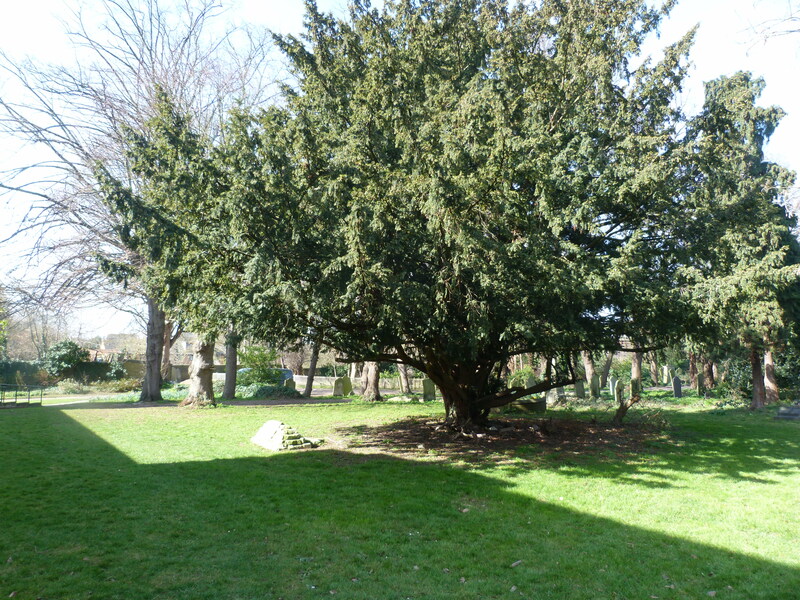 A yew tree and plaque mark the site of the so-called “plague pit”. This entry was posted in Far flung London on August 6, 2015 by Bob Jones - The Lost City of London. Isn’t it interesting how many different things and buildings have occupied the same site over the many years. Thanks for your great research.